They’re tasty, they’re popular and they’re portable. It’s quite obvious that tacos are one of America’s favorite “fast” foods. These delicious little Tex Mex creations are so simple yet unique, like salty little snowflakes. No two tacos are ever alike. And of course, since Austin can’t do anything normal, you can always find an eclectic array of new Tex Mex treats to try. So instead of opting for the familiar, why not take the taco less travelled – or tasted- and try these completely crazy and totally delicious tacos around Austin. Set up inside the ritzy Hilton hotel in downtown, Austin Taco Project is an upscale Tex-Mex fusion restaurant that serves up inventive tacos and great craft beer from around the world on tap. From the bar you can get salty finger foods like Charcoal Wings, Korean Nachos and cage free Deviled Eggs. 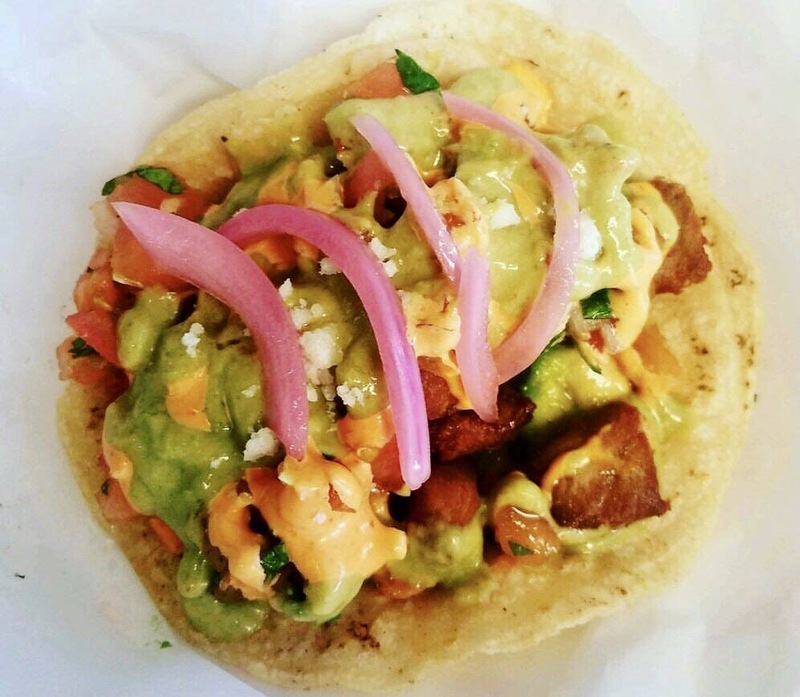 Or you can try one of Austin’s Taco’s Project’s funky mashups which include the vegetarian P.E.T.A taco with beer battered avocado, the Oc-Thai-Pus with shaved Thai octopus and the Pineapple Express taco with pork belly pastor and pineapple. But for a pacific treat that perfectly blends land and sea, order the off-menu Poke Taco, which is made with fresh seafood and veggies in a thin rice paper shell. El Tuna Carnitas Taco @ Baja St. Situated inside a small food truck in south Austin, Baja St. is a unique fusion food concept that blends exotic Japanese flavors with zesty Baja recipes. This clever Tex Mex amalgamation is home to some bizarre but bodacious dishes including the Watostada with sashimo ahi tuna, Sriracha Honey Shrimp and Dragon Balls: fried panko breaded balls filled with cream cheese, shrimp and crab. But most people who love Baja St. can’t stop raving about the tacos, which are deep fried envelopes of heaven. El Original Tempura is the signature go-to taco with tempura battered shrimp or fish, purple and green cabbage and avocado salsa. And El Avo is the all-veggie offshoot with Panko breaded fried avocado, queso fresco and mango habanero salsa. But El Tuna Carnita is the real hidden masterpiece on the menu. This spicy explosion of flavors contains deep fried tuna, white and pickled onions, cilantro, spicy mayo and creamy avocado salsa. Located in north Austin, Yummi is a casual Asian/Austin eatery that specializes in eastern-influenced Tex Mex and traditional American cuisine. At this scrumptious spot you can find a delicious melange of menu items that range from burritos and Banh Mi to burgers and Asian-style barbecue. Some of the local food favs include Kimchi Fries, the Big Tex Yo-rrito with beef bulgogi and the Sunny Side Burger with bulgogi and fried egg. Their fairly straight-forward tacos are only $2.29 and can be made with tofu, eggplant or meat. But the taco at Yummi that outshines them all has to be the mouthwatering, meaty Greek Taco. This “yummy” Mediterranean-inspired taco is made with Greek gyro meat, spicy Ziki sauce and feta cheese. Recently expanded from a small food truck to a brick and mortar building, One Taco is a Mexican-style urban eatery in north Austin. This friendly food stop serves beefed up tacos made with fresh housemade tortillas, bomb botanas and authentic Mexican craft beers that will put hair on your chest! Tacos offered at One Taco range from breakfast to lunch to dinner and include the Relax Taco with refried black beans and avocado, the Gringa with pastor and pineapple and the Big Kahuna: aka the official Austin Marathon taco. But if breakfast is your favorite meal of the day and you want to do it right, then head to One Taco beforen 11AM and feast on the Pancake Taco. This sweet and savory sensation is like a meal all by itself with scrambled egg, bacon and potato all served on a hot pancake with a generous side of syrup to slather over it all. 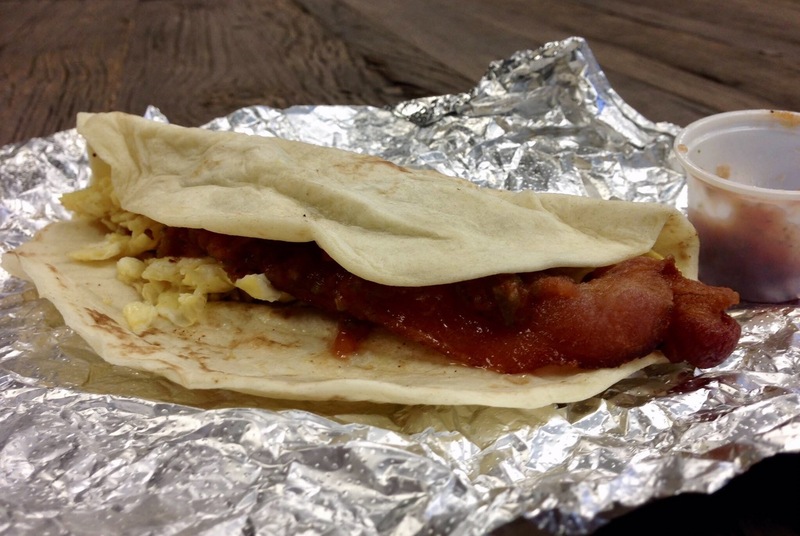 Syrup on a taco…it doesn’t get much weirder than that. The delectable brain child of venerable taquero Tyson Blankemeyer, Tyson’s Tacos is a fun neighborhood taco shop in the airport corridor of Austin. This irreverent eatery specializes in some seriously good taco creations made with quality and care. Not only is each taco unique in flavor, but they also have cheeky nicknames that make ordering that much more fun! There’s a little bit of Asian influence, a little bit of Mexican and a lot of Austin in each bite of these bad boys. Between the Wild Feminist with egg and house sausage, the Robinsonian with migas and bacon and the Senor Ranger with fajita and queso fresco, you won’t know where to start! But among the more ingenious inventions on the menu are the Burnt Ends Taco – available until they’re out of ends – and last but not least the Crispy Duck taco – a lip smacking Banh-mi-ish treat that blends east and west with cucumber, green onion and Chinese hoisin sauce. A hot new food truck parked in east Austin, Kurry Takos brings together the exotic spices and flavors of India with the traditional cooking styles of Mexico. This Indian/Mexican fusion spot offers an interesting mix of classic middle eastern dishes such as saag paneer and tikka masala, and amazing Tex-Mex hybrid creations including Kurry’s famous Takos. Order just about any “taco” on their menu and it’s probably going to be the weirdest (and most incredible) you’ve ever tried. The Chennai Express Tako is feisty and flavorful with chicken, pickled red onion, cilantro and jalapeño crema, and the Manchurian Tako is sweet and tangy with chicken chilly, Asian slaw and chilly crema. But for an explosion of fusion flavors unlike any other, try the sublime Grilled Paneer Tako with paneer tikka, toothsome tikka sauce, cilantro, green chutney and coco rice on a warm corn tortilla. Located in north Austin, Peached Tortilla is a trendy Asian fusion restaurant that serves up fresh and healthy bites for breakfast, brunch, lunch and dinner. Along with an enticing food menu packed with nutritious plates, Peached Tortilla also offers a handful of fresh craft cocktails, good wines and a great selection of local and imported beers. From fresh Ahi Poke bowls to Pickled Strawberry and Goat Cheese Salad, the masters at Peached Tortilla know how to create original and outstanding recipes that will keep you coming back for more. If you’re craving a taco with a twist, try the Asian-inspired Chicken Pad Thai Taco with chili garlic chicken, eggs, pad thai sauce, shiitake, cilantro, bean sprouts and peanuts.